Here’s what’s happening in the world of television for Tuesday, November 20. All times are Eastern. This Is Us (NBC, 9 p.m.): Peak This Is Us is probably actually any Super Bowl-related episode, for football/slow-cooker reasons, but Thanksgiving with the Pearsons is always an extremely This Is Us affair. Think about it: There’s plenty of room for weird traditions, sadness, and cheesy enthusiasm. There are loads of memories and many opportunities for lingering shots of empty chairs, or empty beds, or aged photographs, or very important medallions. Everyone’s around, so a maximum number of eyes can slowly fill with tears. 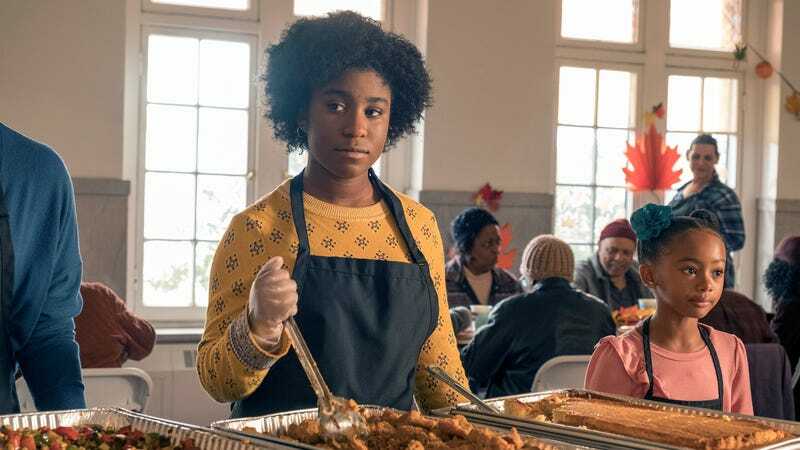 And as previous seasons have taught us, Randall Pearson (Sterling K. Brown) loves Thanksgiving, so there’s a decent chance of a “Randall overdoes it” storyline, which is essentially its own This Is Us subgenre. Based on the preview above, it looks like we’re also getting a very special Vietnam Christmas with the Pearson brothers, so one of this season’s mysteries will continue to unfold. Caroline Siede will briefly halt her pie-making prep to help us digest This Is Us-nksgiving. Busy Tonight (E!, 10 p.m.): If you watched last week’s The Good Place, then you already know why we are absolutely going to check out Busy Philipps’ interview with D’Arcy Carden. If you have not watched last week’s The Good Place, then get on it so you can also eagerly anticipate this conversation. I mean, she’s charming regardless, but there’s no way they don’t talk about that scene, right?